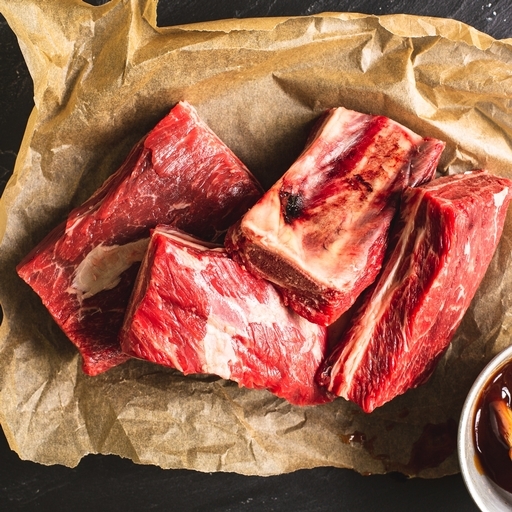 Versatile organic beef ribs with real depth of flavour. A winner on the barbecue – or grilled, stewed or slow-cooked in the oven. Good with a Korean-style soy sauce marinade, or with a sweet, sticky, finger-licking American glaze. Remove all packaging. Season the ribs well. Slow cook in a covered roasting tray with a dash of water at 160˚C/Gas 3 for 2½ hours, until tender. Cover with your BBQ sauce of choice and finish on a medium BBQ for 20 -30 mins, turning and basting often. Alternatively, finish uncovered in the oven, turning often, for 30 minutes at 200˚C/Gas 6. We source our organic beef from farmers who allow their cattle to roam free across their fields. They are reared on a natural grass diet giving the beef a fuller flavour, with some hay, silage and a little grain in the winter months. Our beef comes from traditional beef breed suckler herds, which means the calf spends the first year of its life with its mother.